This entry was posted on 11111111, in Practices. One of the main defects of a practitioner comes from thinking, “I am the one who is practising, so I am the one who will realise this and that through my practice”. As long as we think that we are the ones who practise and that any outcome will be because we made the necessary effort, we are completely in the wrong. Nothing will result from that except more ego-clinging and self-importance. We should think quite the opposite: that everything that emerges in our practice does so thanks to the Dharma. All the qualities that appear are only because of the Dharma. It is only through the quality, the power and purity of the Dharma itself that something can change in us. This is the way all the great bodhisattvas have practised. There is nothing that comes from the individual — things emerge because of the quality of the teaching. It is through his relationship with the Dharma that an ordinary practitioner can transform himself and become a great bodhisattva. All the qualities that emerge in a great bodhisattva have nothing to do with the individual person. They are the same qualities that are to be found in all bodhisattvas, because they come from the same Dharma, they express the quality of the teaching itself. We should be happy and think, “Now I have decided definitely to practise the Dharma, there is nothing else that interests me in this life, I want to dedicate my life totally to this. Whatever comes out of my practice is thanks to the Dharma, it has nothing to do with me. I am not going to take pride in the results as if they were mine.” When we surrender ourselves in this way and just practise the Dharma with no speculations about the outcome, we completely abandon ourselves to the practice. We are not expecting something out of it. We abandon all attachment to experiences and results of practice and engage in Dharma activity. This is when true experiences and realisations can develop. But first we have to completely give up this feeling of “I am doing something, I am getting results”, always bringing everything back to the “I”. If we do this, we are just nourishing the ego-feeling, which shows a lack of confidence in the teaching. If we have complete confidence in the Dharma, we no longer have any feeling of “I”. We just do the practice, and then the Dharma starts to work and real transformation takes place. This is the only way that experiences and realisation can develop. We can measure the progress of our practice like this. If we think, “I have practised and I have realised that”, then the only result of our practice is that our I-feeling is getting coarser and coarser, so our practice is completely wrong, since the very purpose of the Dharma is to reduce the influence of the ego. But if we think “I am not a good practitioner, I have no real qualities myself”, that shows that our feeling of “I” is growing smaller and more subtle and that we are becoming a genuine practitioner. A real Dharma practitioner is someone who is constantly putting aside his own benefit and concern for himself. This entry was posted on 11111111, in Uncategorized and tagged ego. The picture i put above is a picture of the great present-day Mahasiddha Achuk Lama Rinpoche who is 84-5 years old now and presently still in Tibet. He is the head lama at a monastery called Yachen Monastery and teaching more than 10,000 monastics (monks and nuns)… many of whom have displayed amazing signs of accomplishments. In recent Tibet history, the reemergence and strengthening of the teachings of Dzogchen after the Cultural Revolution have been largely attributed to the efforts of the two Dharma Lords likened to the sun and moon of Tibet. The sun being H.H. 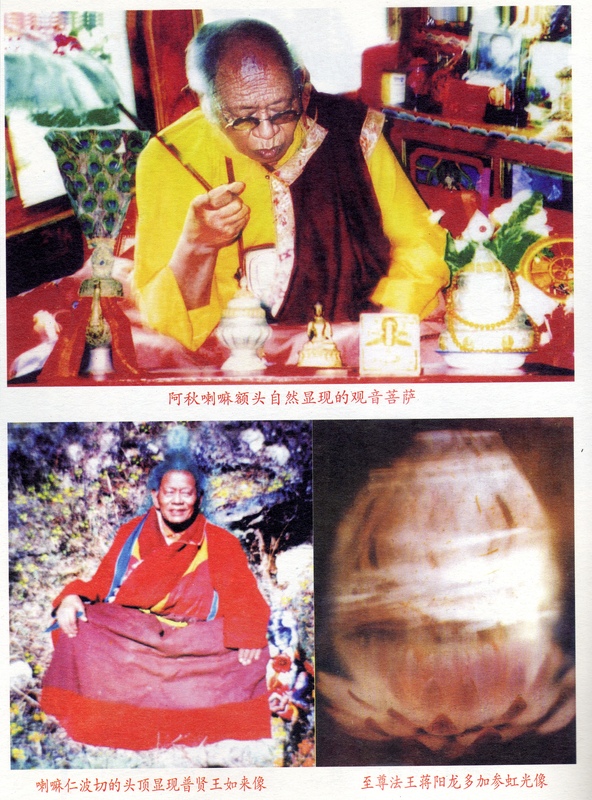 Jigme Phuntsok (who is also the Guru of Dalai Lama and no longer with us physically), the moon being H.H. Khenpo Achuk Lama Rinpoche. Achuk Lama Rinpoche is also a present day Terton and has opened up many sacred mountains for the benefit of many beings in Tibet. He has retrieved many termas whether as statues or ritual implements or practices. His wave of activity is impossible to describe and many of his disciples are realised on the bhumis and have traversed the four visions of Togal. Achuk Lama Rinpoche is widely acknowledged to be the emanation of Longsal Nyingpo, Longchen Rabjam, Padmasambhava’s disciple Gyalwa Choyang, and various other great masters. He has displayed many signs of miracles such as freely leaving hand-prints, foot-prints, discovering termas, going into the water for days without harm, knowing the past, present, and future without any impediment, and most popularly for his body mandala and many thousands of people have witnessed the many deities and mandalas of the major tantras present in his body itself. Seeing his body mandala is a unique means of blessing, empowerment and also a way to ascertain the disciple’s realisation. For some karmically ready people, it is also an introduction to wisdom mind. 1. The photo proves that accomplishments are present in this day. Many of Rinpoche’s disciples in China have attained accomplishment, including layperson disciples. May extensive enlightened activities be unfurled as you wish. To you who are the embodiment of all the Yidam-deities, realm & awareness undivided, I pay homage! By this merit may all sentient beings attain total liberation! Auspiciousness! P/S: If you circulate the photo please do proper explanation of the context to minimise any faults arising from misunderstanding. May all that arise from this post and photo create causes for sentient beings to recognise their own primordial basic nature. Emaho! Note: To the grief and misfortune of sentient beings, Achuk Lama Rinpoche has just passed into Parinirvana this year on the early morning of 24th July 2011 at around 2am. There were many signs of accomplishments and miraculous sightings and happenings. His body shrank to about 1 inch. He sat in Thukdam or meditation for about slightly more than a month. I pray that his rebirth will swiftly come to us. This entry was posted on 11111111, in Uncategorized.